General Performance Index (GPI: General Performance Index): "It is an index that measures the performance that a tennis player has had in a given period of time." This index, not shown here, is used to make the "Performance Ranking or GPI Ranking". This index considers, for its calculation, a series of aspects such as the number of matches played and won, the serves, the points earned with the serves, the returns, the break points (saved and won) and the tiebreaks. Once these indexes are calculated to certain period, season 2018 in this case, these indexes are ordered from highest to lowest and a ranking is established. This ranking is the Performance Ranking or GPI Ranking that is used to order the players by merit of performance in the season, in this case. As already it mentioned in other articles, the WTA Ranking necessarily not should coincide with the Performance Ranking, in fact, rarely happens. This Ranking of Performance is very useful because it allows analyzing and quantifying what has been the performance of an athlete in relation to the other players. It is often the case that a player improves her WTA Ranking and worsens her Performance Ranking and vice versa (see Table 1). Now we have two years of Performance Rankings where interesting conclusions can be getting. Everything has an explanation when you have the data and its correct processing. The emotions, the circumstances, the environment, the importance of the matches, the intensity of the training, the coaching, the food, the weather, the time of the year, everything, absolutely everything is implicit in the statistics. Working with a huge amount of data and ordering them in a certain way, allows us to analyze and study these aspects. The WTA Ranking reflects the order of the players based on the amount of net points won or lost during a period. The higher the number of points, the better will be the ranking. In the case of the Performance Ranking, the performance in serves, returns, break points, tiebreaks, etc. are considered. Next step is calculating the general performance of the player to synthesize it in her General Performance Index or GPI. As I have already explained, the calculation of this index for each player is only the first step, the second step is to order this index (from highest to lowest) to establish the order of performance of the players. In general, as can be seen in Table 1, when a player improves or worsens her WTA Ranking, she improves or worsens the Performance Ranking. Sometimes it is not like that and there are explanations why this is happens. For example, let´s look at the Caroline Wozniacki’s case to quote an outstanding tennis player. Wozniacki finished 2017 and 2018 with the same ranking 3, it did not change in the last two seasons. However, her Performance Ranking drop from 1 (2017) to 12 (2018). Someone distracted could point this out by commenting: why did her performance drop if she kept the same WTA Ranking? In this case, Caroline Wozniacki had the best Performance Ranking of the 2017 season with two won finals over eight. In 2017 she had an excellent performance. In the 2018 season she had four finals and won 3, but one of those won finals was the Australian Open (At the AO 2017 she lost in 3rd round 3-6, 1-6 against Johanna Konta [GBR]), the other two were a Premier and a Premier Mandatory that awarded many points. It could be said that the fact of having won a Grand Slam helped her to maintain the ranking 3 of the WTA because his performance of the 2018 season with respect to the 2017 season was worse, always relatively speaking. Obviously, having a worldwide Performance Ranking of 12 and a WTA Ranking of 3 is not to complain, but it is true that the 2018 performance compared to 2017 was lower. We will see in 2019 how this talented player defends the crown at the Australian Open. We will briefly comment some interesting points. One of them is the performance of the Belarusian Aryna Sabalenka of remarkable performance this season 2018 with respect to the 2017 season. Note in Table 1, how this young player has climbed markedly, both in the WTA Ranking (↑ 62 positions) and in the Performance Ranking (↑ 80 positions). Sabalenka is demonstrating a great capacity for work and achievement of objectives. It´s about doing things in a certain way so that the goals are met and Aryna is achieving it and if she gets regularity certainly will outstand in next seasons. I extend the same comments about Sabalenka to the following tennis players who have taken a leap of quality, both in the WTA Ranking and in the GPI Ranking (Performance). These players are: Petra Kvitova (CZE), Naomi Osaka (JPN), Mihaela Buzarnescu (ROU), Petra Martic (CRO), Camila Giorgi (ITA), Ajla Tomljanovic (AUS) and Danielle Collins (USA), among the most outstanding. Table 1 shows a comparative table between the 2017-2018 seasons. The WTA and GPI (Performance) rankings and their respective variations between seasons are shown. Table 1 is sorted according to the 2018 Performance Ranking. There are two small columns next to the columns of the 2018 season, the first one shows the variation in the ranking positions and the second column shows an upward arrow (↑), descending arrow (↓) or = of the respective variations of the rankings. Before continuing, we must inform that we have changed the criteria to select the Top 150 regarding the 2017 season, so, if the following tables are compared with those of the previous season, in some players differences will arise regarding the Performance Ranking. For example, if you look at the Performance Ranking of Aryna Sabalenka in the 2017 season in last year´s reports, Aryna had a Performance Ranking of 76, and this year is listed for the 2017 season with a Performance Ranking of 83 (Table 1), the latter is the true one. The other ranking (2017) is not wrong, only that it was calculated with another criterion. Last season we made the calculations of the Performance Rankings selecting the WTA Top 100, so there were players that without belong to the WTA Top 100 had better Performance Ranking than some WTA Top 100, for this reason, these players were not considered in the tables of Performance Ranking 2017. Those vacancies were filled by other WTA Top 100 players. On the other hand, this 2018 season the Top 150 selection was made considering the Top 150 of best performance in 2018. That is, we adopted the performance criterion to select the 150 players with the best world performance in the 2018 season, regardless of whether they are WTA Top 150. When comparing the seasons in Table 1, we had to homologate the 2017 season by recalculating it and differences have arisen in some players because of the comments above. From now onwards, we will use the performance criteria to select the Top 100, 150, 200, etc. 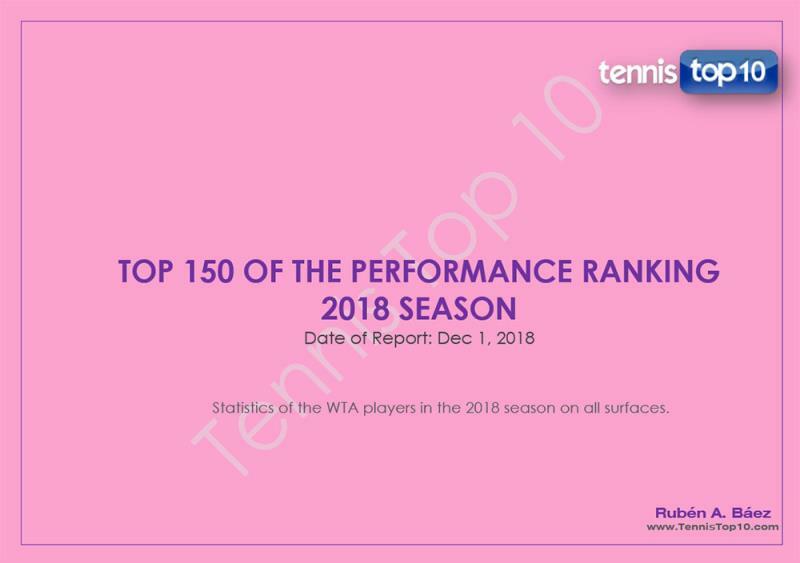 We also mention that we have chosen, in this 2018 season, the Top 150 instead of the Top 100, to make sure that the WTA Top 100 will be included in the Top 150 of the Performance Ranking, which has happened. a) WTA: WTA Premier Mandatory, Premier, International, WTA Finals and 125K Series. b) ITF: Australian Open, Roland Garros, Wimbledon, US Open. The WTA Ranking for this report corresponds to Monday, November 19, 2018. Tennis Instructor Level II (Argentine Tennis Association), Bachelor in Business Administration, Certified Public Accountant, Post grade’s degree in Finance Management and Capital Markets, MBA (IAE Business School, Austral University, Buenos Aires, Argentina).